Located in Bayonne, France the House of Departmental Solidarity features five courtyards aimed to create mesmerising singular spaces. The videographer, Lucas Bacle of Brumm Films, and architects at Leibar&Seigneurin create a stimulating journey into the municipal space. Initially, the subject that the videographer wants us to focus on seems to be unclear. Most of the establishing shots are from a distance, so the building blends in with the rest of the surrounding area. As the camera trucks sideways, we see the perimeter of the administrative building; the minimalist colours as well as the sharp white corners of the building gain prominence. Gradually, the camera inches closer, beckoning to the mystery inside. The establishing shots draw nearer to the building; we can now see the intricate shadows that carefully fall on the building's entrance, adding to its elusiveness. However, once inside, the camera starts to dolly back. The camera then meticulously trucks sideways showcasing the glass screens. We now see the reason for the camera's apprehensiveness. They each stand in the middle of the airy courtyard and gently rustle in the autumn wind. Their leaves whisper, gesturing us to gaze upon its beauty. Olive trees. They are the heart of the municipal space. The camera circles around the trees, careful to not go too near. These hidden gems are too sacred for the average eye to take in all at once. One must teeter around the sacrosanct jewels to fully appreciate the space. 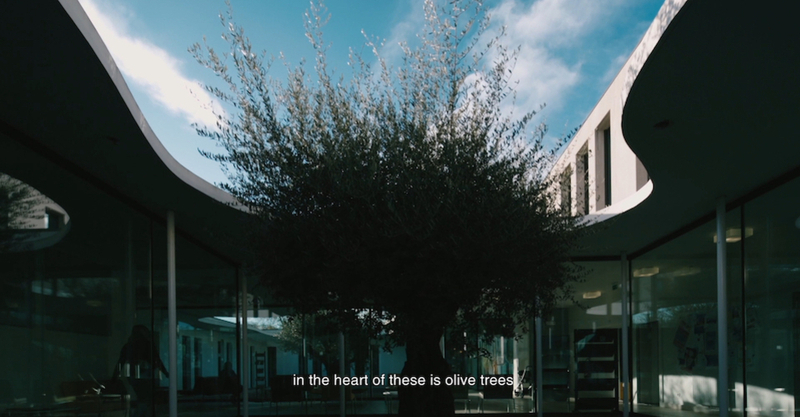 The olive tree, a symbol of peace and sanctity is a fitting element to the space. Municipality buildings are often havens to those who need access to basic care or welfare. These sacred treasures create a welcoming and tranquil atmosphere to those in need. The film team at Brumm as well as videographer Lucas Bacle are adept in the art of storytelling; they subtly engage the viewer, showcasing the enchanting architecture as well as provide a creative narration of a unique story. This is a useful approach because it does not inundate the viewer with cryptic architectural images, but instead provides a narrative context that help position these architectural gems.